Interesting...I'm not a packet-trick person - I don't want to carry it around, just as I won't carry even regular decks anymore, but way back in Trend Setters (1990) - re-written, updated, etc., along with Quantum Leaps, Dingle's Deceptions, Numero Uno, The Great Divide, etc. - in The Classic Collection (2010), Vol. 3 - quite a bargain - I taught a 3-card (packet?) effect called Melt-Through, which I did carry around and perform often back in the day. I sold many of them at lectures in the early 1980s. Once you make it up it can be used over and over again - until the cards wear out! Anyway, it's taught there, all credits given, etc. This thread just reminded me of it. You might enjoy it. This is a booklet by Richard Paddon. I isn't dated but it lists over 200 different packet tricks from over 70 different books. They are not taught. He does teach 2 at the end of he booklet but it is a pretty good reference list by book, author, page and type of effect. 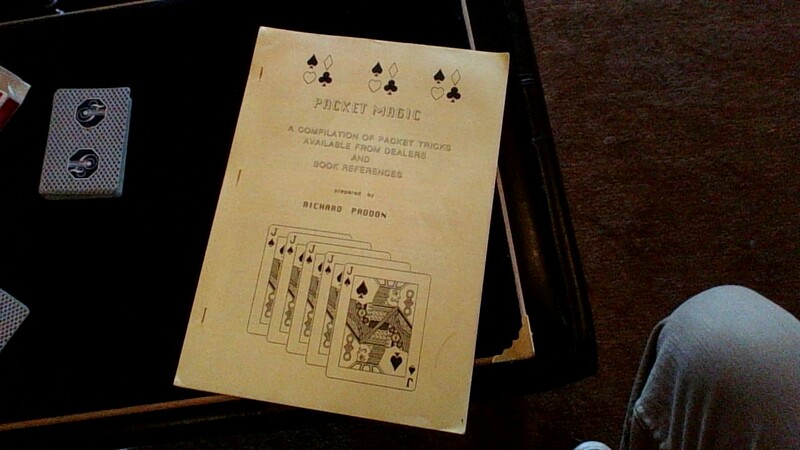 The intro entitled; Packet Tricks A Brief Investigtion by Richard Paddon gives a lovely overview of the packet trick. "one annoying problem is the number of useless books released each year that contain endless variatons and so called improvements that are actually a step backwards. One example of a GOOD variation is Harry Lorayne's MELT THROUGH which is an improvement of J. C. Whyley's 'Elusive Lady'. " Clearly this thread shows that Paul Hallas has an incredible knowledge (and chops) when it comes to packet tricks but if anyone wants to find where any particular packet tricks are published or originated then PM me and I'll see if its in the booklet. But to be honest, if I was you, I'd check with Paul Hallas first. I mentioned Richard's book in "Still Small, Still Deadly" . I believe Richard still supplies it, but in e-book form. It is a great listing of packet effect. So, if you know the title of an old packet effect this booklet may help you find where it appeared or if you own a book referenced you might actually investigate what the packet trick is that was listed. Obviously it won't help you out with any packet effects released over the past 20 years or so. It is a good companion to the SBD books though. I've found a lot of people trying to track down old tricks don't remember the trick names though. Richard is a mentalist these days. I have used a lot of packet tricks in the past years.One come to my mind is--Quadraplex by Nick Trost.I am trying to find it and purchase it.No one seems to sell it anymore.It was an amazing effect that totally would mind blow anyone!I wonder if anyone knows or even has this trick? Find this book: Quadraplex is in it. The GREAT packet tricks of Nick Trost. All the tricks require special cards (not supplied but easily obtainable) or simply duplicates of some cards. UN-CARDS: A beautiful prediction effect using blank-faced cards (the Un-Cards). The selected card is shown to be the only red card of the packet. The prediction says, "YOU WILL SELECT THE RED CARD." EXPANDING CARDS: A stunning, visual effect! A fan of five miniature cards (say A, 2, 3, 4 and 5 of Clubs) expands to large ones in a blink of an eye! So easy to do. For close-up, walk-around, etc. KOPY KAT: From two packets of cards you and a spectator take a card each. The cards match and all the other cards are seen to be the same. Everything can be examined! FLIM-FLAM: You place a card on the table and try to print three duplicates of that card from blank cards. The card is the 5D and you print three 10C....Mistake? The three cards change into all 5D's! A PACKET OF BACKS: Four cards turn out to be the same (all 10D), then they are all double-backed cards, then blank-faced cards and finally, they reveal a selected card! TWISTO BLANKO: Four cards (say the four Queens) turn face down one at a time and then all the cards become blank on both sides! JUMBO TWO-WAY SPLIT: From cards cut in half two spectators picks the two halves and they are seen to match. Not only that, you predicted that card! What an amazing trick this is! QUADRAPLEX: You show two predictions. Then a spectator shuffles quarters of jumbo cards and at the end only four cards are face down in the packet. The first prediction is correct. The four cards are assembled and they make a whole card but with a mismatched corner. The other prediction is the same card with the same mismatched corner! Thanks!I knew about the book,but I was hoping actually to have the Trick itself.I have been telling the Magic shop I go to about Quadraplex.They know about it,but Can't get the actual trick itself.Yes I might have to buy the book,and try a make it myself.But Thanks for your imput!! The trick was obtainable from Rachel Wild up until she stopped trading in January of this year. There's a clip of me performing it earlier in this thread.Aldo on Trost Vol.6 is a DVD. The best description of it can probably be found in "Nick Trost's Subtle Card Creations Vol. 3". Thanks!I guess the trick itself is now a collector's item.I still have some of the Nick Trost packet tricks.There was one recently on Ebay--Half and Half,which I missed.I guess it's like the Tenyo collection.Most of the the rare ones are very hard to find. Here you go. Found it in Canada for you. It's amazing that you found it! !I will try a buy it on the site that you gave me!Thanks!! Do you have any of the packet tricks by Nick Trost? Yes, I have to see which ones. I bought a bunch of them once when someone was selling. Some are pictured in another Packet Tricks posting on this site. I should post more. Just got sidetracked with other projects. Ok. Great talking to you,and thanks again for the info! !I will talk later,take care! I just ordered the card effect--Quadraplex by Nick Trost.I hope they have it in stock.Some of the magic shops don't update their inventory.The magic shop I go to,will be overwelmed if I do succeed in purchasing it.They will probably want me to preform it,lol.Even I don't get it, a big thanks anyway!! When I stared out with sleight of hand card magic, I purchased many of those packet tricks in the 1970’s. Luckily for me, the sales/demo guys at the magic store (one of whom was Phil Goldstein) took me under their wing, and advised me to read books by Dai Vernon, Frank Garcia, Slydini, Paul Harris, etc. And then one day I saw the late Irv Weiner approach a table at a magic convention. He borrowed a deck from someone, and proceeded to amaze everyone with mind-boggling card tricks! On that day, I decided that I wanted to be able to do magic using a regular deck of cards … and preferably a borrowed one. Anyway, back to the original question about packet tricks: I still do Color Monte … but my own version, using regular cards. Thanks for your reply!I use an assortment of prediction tricks with cards and books.I do use packet tricks still,for they amaze me!Some are better than others.I also use regular decks of cards also.Sometimes I switch from a packet trick to a borrowed,or my own deck.That way my audience won't be too suspicious.I recently purchased a Nick Trost card effect called--Quadraplex.I believe you were the one that found it for me!! I didn't expect to receive it from the company,for most shops were out of stock.It's truly amazing effect that's a stunner! !Thanks for your info again!! Hey johnnyjay, I hope you can make a video of that effect once you have mastered it. I would love to see it performed. Thanks! And if you have the chance and if it is still available, I would suggest you buy 1 or 2 more of that effect before it is gone for good. If you use it, and it sounds as if you will use it until it wears out, you may want to buy it again and it will be no longer available. Just a suggestion. ... I recently purchased a Nick Trost card effect called--Quadraplex.I believe you were the one that found it for me!! I'm not the one who found Quadraplex for you. I believe it was Evil Dan. Concerning the card effect Quadraplex,I would certainly like to buy a couple more,that's providing anyone would sell it to me,or a magic shop that has it in stock.When I preformed it on my wife,she had no Idea how this effect could possible work?It's amazing that you can get anyone to shuffle the halves of cards,and put them also before you do the trick! !The magic shop I bought it off,only had one in stock.I have a face book page were I put different tricks on as a video.Hey does anyone know about the NEW CARD DECK,TRIPLE "C'?It was preformed on Tannen's magic site. I'll add that Nick Trost's Trick-Kards is also worthy of note. So much happens with just five cards! It first appeared as a marketed item in 1982 and was published in The Magic of Nick Trost. But the best version (in my opinion) appears in Volume Four, page 759 of Nick Trost's Subtle Card Creations. This is Dan Block's take on the effect and it's great. My own little addition is that instead of multi-colored backs as the finale I use blank backs to show, "it was all an illusion." Back in June 2016 on this interesting thread, I mentioned "Color Monte" as my fave packet trick. And it probably still is, but one I have always liked almost as much was put out by Jerry Somerdin a few decades ago called, "You Must have Been Drinking." It is a very entertaining and baffling routine where you give the spectator a sobriety test of sorts. Each of four apparently blue-backced cards (the sevens, for example) magically turns face down, then face up again, ala Twisting the Aces. Then after all the cards are all shown to again be face up, the backs are all shown to have changed to red. (One of the best applications I have ever seen for the Flustration Count). Finally, the tag line is, "I know you must have been drinking and I think it was beer, because you got beer all over my cards." The backs are then shown each to have a different beer logo, Budweiser, Coors, Coors Light and even the dog, Spuds McKenzie. It is a seemingly impossible series of transpositions and transformations. I still have the two sets that I originally bought, and they are in great shape because the cards came laminated. I still do the trick from time to time, especially in the bar. And I really should give honorable mention to "Eye Exam," by Danny Archer. It's killer. 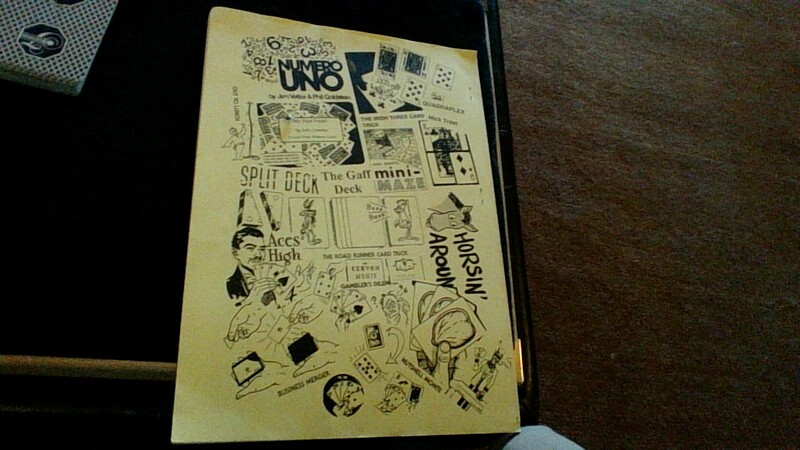 A much belated response to Evil Dan: I still have some tricks purchased back in the 70s and 80s, many from Tannen's: ""Cardsplitpinetration" - no creator credited; "Inquisitive Gambler" - Ron Frost; "Bullseye" - Father Cyprian and Frank Garcia; "Jumping Jack Rabbit" - Emerson & West; "Phantom Monte" - Karl Fulves; "Sidewalk Shuffle" - Martin Lewis; "Backflip" - Sam Schwartz. The only ones of these I return to are "Bullseye," and "Jumping Jack Rabbit." So many newer ones that I like better, some of which are based on these. Should have added that I was new to magic in the mid-70s, and was at times undiscerning about what I bought - why else "Cardsplitpinetration." Also have a number of interesting effects from Richard Kaufman, Daryl, Gary Ouellet, and others from around that time. I didn't buy these in the 70s, but just in the last couple of years. But perhaps that just means that these have stood the test of time?! Nick Trost's packet tricks The Unknown Card and Bigfoot are both relatively easy packet tricks that are a great deal of fun. The customized cards really helps make them memorable and entertaining. I think they were released at some point by L&L Publishing as part of a collection of eight such Nick Trost packet tricks, but I suspect that they were created quite a bit earlier, published in his books. The moment where the 10s and 4s are shown to have vanished creates a real strong reaction, and while the need to "pocket" the Unknown Card is an inherent weakness in the effect, the final reveal of The Unknown Card is an amusing kicker that generates some smiles. It's very easy to learn and perform, so you can put all the energy into making a good presentation. I've had good results and a lot of fun with this beauty. It took me a bit of practice to master all the moves correctly and in the right order (and with cards oriented correctly), but it's well worth the effort. The "Bigfoot" story lends itself to some nice story-telling, which will be very engaging for an audience. The artwork on the cards is very clever (and necessary for the effect to work), and really helps set this effect apart from "regular" card tricks. It is not quite as strong or surprising as Trost's "The Unknown Card", but the final kicker is still a good surprise, and can generate some good reactions from spectators. Man I love that routine Paul! Is it a marketed effect or in one of Peters books? What a lovely packet trick! I loved the story-line and patter, and the "cracking of bones" is a very nice touch that fits with the presentation beautifully. The packet is begging to be examined by a curious spectator at the end (despite showing the cards cleanly in the final phase), or perhaps just a curious magician. But very nicely done, it's truly a lovely routine, and performed very well in this video clip. Another packet trick I bought and that is almost a self-worker is "The Nebula Card." It is a Twisting the Aces variation with no sleight of hand involved. It was a marketed routine. The Shapeshifter patter presentation is mine. EndersGame said the packet is begging to be examined by a curious spectator but I never got asked when I used it. I quickly moved on to some other effect. Besides, there is only one card to 'lose' should someone ask. The effect gets a mention in my packet trick book "Small But Deadly" in the Peter Duffie chapter and I think I shared the Shapeshifter patter idea in my column in one of Al Smith's magazines years back. My favorite is Trans-Print..Currently trying to translate it to Jumbo cards. Wish someone would re-make some of the classic packet tricks of the 70's.. Some of the Emerson and West ones were reproduced some years back but I don't think sold too well. Some of the plots have been improved upon. Sympathetic Aces for instance, better versions have I think evolved thanks to by John Bannon and Paul Gordon. The Trost ones are detailed in his books so you can make them up yourself (except for specially printed card ones like Polish poker). I think there are plenty of good modern packet tricks available, but a good trick is a good trick no matter how old it is. Nick Trost produced some great ones with custom cards - a couple of my favourites include Bigfoot and The Unknown Card. The use of novelty cards really adds to the fun of these. I believe the Nick Trost packet tricks are still available. I'd like to see Circus, Time Out, Symbol Simon and Russian Roulette which is one I haven't seen since I bought it in the late 70's. Some of them certainly are! A bit of synchronicity - When I just scrolled down, by chance I hit the post by Paul Hallas where he mentions Sympathetic Aces. That's what I planned to comment on! I guess the stars are in alignment. Ronay's Sympathetic Aces is what got me into magic in the first place. I saw it demoed at Tannen's in the late 1970s and bought it as well as an Invisible Deck. After finally figuring out how to do the Elmsley and Jordan counts, my eyes were opened to what sleight of hand was all about. I was in! It's a great trick and I think it's still available. Funny how things work... Sympathetic Aces was my first Packet trick as well and what got me past the beginner toys and showed me what could be done. All these years later -- 2 completely different paths that started at roughly a similar point -- fun stuff! I remember some cards for packet tricks were hot stamped or foil stamped. Color Monte is a good example. However there were some that were stamped with so much pressure that the design could be made out on the back of the card. I think Russian Roulette was one of them. I had to look through several packs before finding a usable set. I remember that. When Meir bought the rights to ESPecially Wild from me in the late eighties he printed the cards on Fox Lake Aviator stock and you could faintly see the impression of the symbols through the backs of the cards on the set I had. Later they were produced on Bicycle card stock and that didn't happen. I believe so far it's been through five printings which is not bad for a packet trick, many never get a reprinting. I still have a set of Color Monte that is like that. I came across what I think is a lovely little quick and easy packet trick, when looking back through my old Michael Ammar videos. It's called Marked for Life. I'd never really noticed it before but I've tried it a few times since spotting it and although it's no magician fooler, it's gone down really well in the friends and family circle. I've done a quick recording of it but don't be too harsh... I'm too close to the camera and it was all very rushed but hopefully it will give a rough idea of the effect. Marked for Life is a John Cornelius creation. I really like the premise of "Marked for Life." Finally, the twisting theme has context. Somehow I missed this little gem.